WASHINGTON — As hundreds of people stood outside the White House and cheered, outgoing national security adviser H.R. McMaster strode out of the West Wing on Friday for the final time. He shook hands with staff and waved to clapping onlookers, his warm exit a stark contrast to the unceremonious departure of so many prior senior Trump aides. 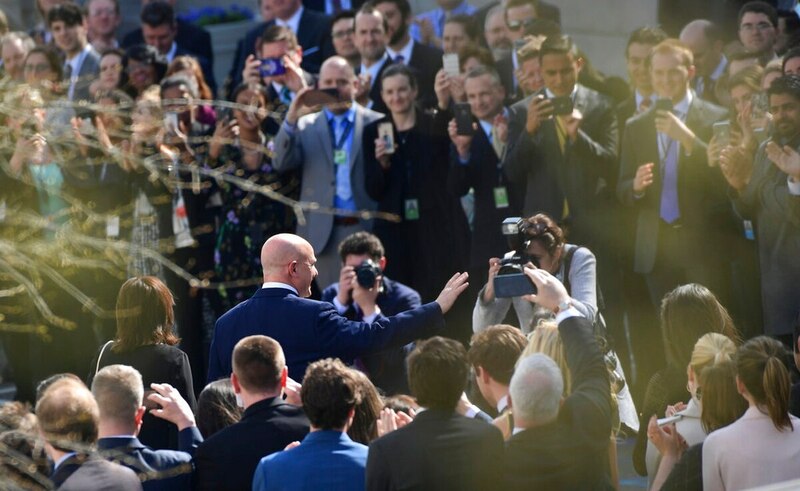 McMaster left after meeting for the final time with his successor, neo-conservative television commentator John Bolton, and then received a traditional “clap out” by staffers arrayed on West Executive Avenue. Press secretary Sarah Huckabee Sanders said McMaster and his family were met by President Donald Trump, who thanked him for his yearlong service in the post. Sanders also praised McMaster during the daily White House briefing, saying it had been a “real privilege” to work with and travel the world with the outgoing aide. In a statement, McMaster praised the National Security Council’s strategic roles in addressing a number of international hot spots, including North Korea, China, Iran, Russia and Afghanistan. He thanked Trump for the opportunity to serve and offered his best wishes to Bolton. A three-star general, McMaster is set to retire from the Army later this year. Bolton will be Trump’s third national security adviser. The White House said McMaster’s exit had been under discussion for some time and stressed it was not due to any one incident. The national security adviser, who took over last year after Michael Flynn was fired for lying about his contacts with Russian officials, had previously withstood an assault from figures in the conservative media who accused him of not being sufficiently supportive of Israel. Secretary of State Rex Tillerson was fired last month via tweet soon after returning from a trip to Africa. Veterans Affairs Secretary David Shulkin was ousted last week amid ethics violations and not permitted to bid his staff farewell. But former communications director Hope Hicks, Trump’s closest and longest-serving aide, received a kiss on the cheek from the president when she left the West Wing for the final time last week. Bolton, probably the most divisive foreign policy expert ever to serve as U.N. ambassador, has been a hawkish voice in Republican foreign policy circles for decades.